Arizer is well known for making quality vaporizers that can arguably be considered some of the best on the market. However, the one negative aspect about their vaporizers was that they lacked portability, as their designs tended to be bulkier and the units came equipped with delicate glass mouthpieces. Fortunately, this issue has be resolved by the creation of Arizer's newest device, the Argo. 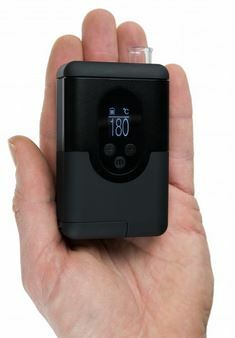 The Arizer ArGo is small enough to fit in the palm of your hand with ease and it hits just as hard and heavy as its' predecessors, the Arizer Air and the Arizer Solo. The device also comes with a cool and unique feature where the unit slides up to become flush with the mouthpiece to protect the glass stem. 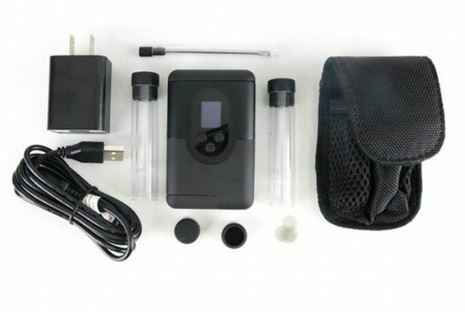 Priced at just over $200, this vaporizer competes in the major league of portable vaporizers and it holds its own effortlessly. Two silicone stem caps – to store dry herb and have prepacked for later sessions. The Arizer Argo is tiny and inconspicuous; it fits comfortably in the hand and it's easy to hide quickly in any pocket or purse. Using the same glass stem technology as the previous designs, the Argo is loaded the same way. It is packed at the bottom of the glass stem that also serves as the mouthpiece on the opposite end. This unit features digital display on the front side. Temperature is continuously displayed, and it can be adjusted with a plus and minus button and the main button is located directly underneath. Also, there is a button on the back of the device that makes the unit flush with the glass stem mouthpiece. This is button serves two purposes, as it aids in both hiding and protecting the glass stem while in a pocket or hand bag. This "flush feature" is an important upgrade from the Solo and Air, as these older units lacked portability due to the fact their glass stems were extremely fragile, and could be easily broken. The Arizer Argo is relatively simple to use. Start by packing dry herb into the bottom of one of the glass stems and loading it into the top of the device. Then, turn on the device by pressing and holding the + button and the main button at the same time. A 3 second countdown will initiate- continue to hold the buttons until the end of the countdown in order for the device to power up. Once the Argo is on, it will display the current temperature. The Arizer Argo has precision temperature control, so press the plus or minus button to select your target temperature. As soon as the target temperature is chosen, the device will begin to warm up. It takes about 25 to 30 seconds to heat up. Our recommendation is for users to start at 375 degrees Fahrenheit and work their way up from there gradually throughout the session for the best results. Once you the target temperature has been achieved, go ahead and draw from the device and enjoy. Also, it’s good to remember that the Arizer Argo comes with 2 silicone tops for the stems so dry herbs can be pre-packed and they are easily accessible and ready for future sessions on the go. 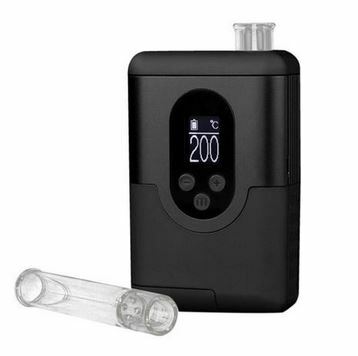 The vapor quality from the Arizer Argo is the mouth-watering kind of delicious and it is comparable to the Arizer Solo and Air in this category, meaning it proudly stands up to the Arizer name. Thick clouds can be produced at 400 plus temperatures, and luckily, the vapor never tastes harsh. However, the taste and quality of the vapor tends to be even more phenomenal in the lower temperatures. Also of benefit is that fact that mouthpiece on the Argo doesn't get overly hot so users can enjoy drawing vapor for the entire session without getting burnt. The Arizer Argo has a removeable rechargeable 18650 battery that takes about 3.5 hours to charge. That is a semi-lengthy wait, however, the upside is if a spare is purchased, you can have one charging while the other is in use. The battery lasts for approximately 1.5 continuous hours which isn't that long all things considered. A good piece of advice is to play it smart and remember that the battery is interchangeable, and be prepared with a spare battery or two so you're always ready to go. The Arizer Argo is a high-quality device that you will not be disappointed paying $200 for Arizer always comes through with great craftsmanship and excellent vapor output in all their units. The only downside to this device is a minor issue of not having any protection for the glass stems outside the "flush feature" within the device. In the future, it's hopeful that Arizer will consider implementing an external carrying case for the stems. To maximize portability, users can try having one glass stem loaded in the device and one packed for later in a safe location. All in all, the Argo is a great buy with its sleek, durable portability, glass stem protective flush feature, excellent vapor quality, and its rechargeable interchangeable battery. It's a solid, premium product that is easy to fall in love with.